The Grahamstown festival costs a lot. It takes up money and time and it soaks up your passion like a wonder-mop. I’m going to run with the mop analogy I think; it has potential. For instance what you get back out depends on how hard and desperately you wring it. I’m not sure how the planning fits in, that might be an aspect that’s important in managing a project like presenting Owl at the NAF but not so much in mopping. There’s a law of diminishing returns that applies to planning for mopping, after an hour of preparation there isn’t much more you can do. Not so with planning a production. The more thought and planning you put in, the better the production will do at festival. I know people with five year plans. Yes, like Stalin – except not, you know, bastardy. I don’t have a five year plan. This time last year I had a one year plan and right now I have two year plan. I’m working my way up. My plan for Owl was to do a two week run at the Intimate Theatre in February / March and then do it at the NAF as part of the Cape Town Edge and follow that with a run at the Schools Fest. From there we’d get exciting offers to go tour or do a run in Joburg. What I wanted to get out of each phase was different. The Intimate run I wanted to road test the material and get press coverage. This we achieved and we even made a modest profit; it’s easy to make a modest profit when your costs are so low. All this I covered here, in my report on Owl. But now we get to the new stuff; how did Owl fare at the National Arts Festival? 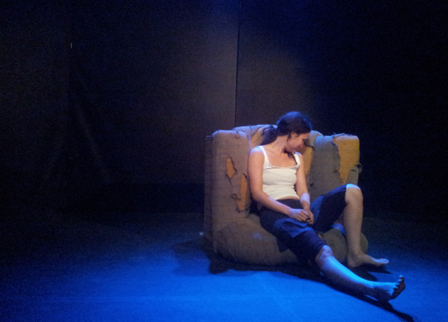 The critical success at the Intimate and the brief run at Kalk Bay Theatre shifted my expectations for Grahamstown. I thought Owl would have some buzz and pick up audiences from word-of-mouth. After all, we had loads of awesome quotes from press folk. But here’s only truth I’ve found in the theatre industry: talent, praise, charm and hard work guarantee nothing. They are necessary – no one gets anywhere without them – but there are no guarantees and you will always wish you had more of those qualities, believing that you could tip the scales just enough. As it was, Owl was not a success at the festival in one, crucial way: very few people came to see it. It was a success in other ways though; the few people who did see it were the right people, the people who you want to connect with, and consequently Owl was invited to two overseas festivals, Brighton and Prague. Obligatory fist pump, just to show I’m excited. OK, celebrations aside, let’s get to the nuts and bolts of what went wrong and what went right. First of all, I’m going to repeat that Grahamstown costs quite a bit. It’s not that any, single charge is unreasonable – it’s that there are so many of them to many different organisations. 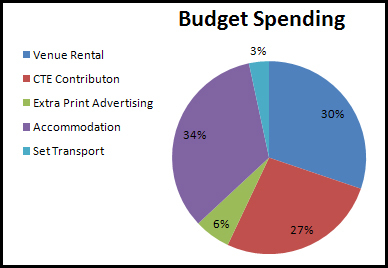 There are your festival costs (registration and venue hire), then there are your travel costs (petrol, accommodation and meal allowances – multiply this by the size of your team), your actual production costs (still mercifully low for Owl) and then your marketing costs (Labelled here as CTE contribution, since that covers the publicist, the posters, etc.) – an area where most people try to save money. By a strange bit of fortune my spending on the Festival, Marketing and Travel areas was more or less evenly divided, which isn’t actually a good thing. There is a rough correlation between the amount of effort and money you spend on marketing so you should always be throwing more into it. Your production values have less of a connection than most people would care to admit and the amount you spend on fringe registration and accommodation don’t connect to your income at all. In fact, since we already had the set and costumes for Owl there was no spending on this area. Here’s a pie chart. My total costs were just under R15 000 while my income from an average of 22 people per show was just under R10 000. So we made a loss of around R5 000. But we were saved financially by the Schools Festival, which runs for 5 days directly after the NAF. We applied with all that good press we’d gotten and so were included. The Schools Festival straight out buys the show, pays for your accommodation and S&T, and fills the auditorium with touring school groups. The additional performances increased our costs by only R500 but tripled our income. So, tip for the NAF: try your hardest to get on to the Schools Festival. That means having your press kit up to date and planning so you have some damn good clippings in it. Where I think I failed was that I didn’t work hard enough to sell Owl to the festival punters. I was stage managing London Road and trying to run the Edge in general (more on the Edge later) as well as popping in on Godfrey Johnson’s two shows – Stories of Crime and Passion and Shadow of Brel. Owl certainly suffered for this. Another oversight is that festivals work differently to runs in Cape Town. The audiences you’re trying to coax in have travelled 800km, they have over 400 shows to choose from and they are away from their social networks – both real and virtual. In their home towns these people are the first wave of audiences, they have their ear to the ground and see a play almost every week. They are the ones who tweet and post on facebook about the must-see shows and they are the ones who listen to the buzz. It’s a situation of the semi-starved going on a binge. You can’t entice them the way you do back home and when they rave they don’t rave to their buddies who don’t often go see shows but might just if the week is looking a bit stagnant. Oh no, they’re raving to other festinos, other theatre-lovers. And most of them already have a pack of tickets booked. The raving has to be so good that they will squeeze in a sixth show on that day or even drop a show they have already paid for. Your marketing has to be better. You’re competing against local theatre legends. You’re competing against a main programme with amazing international artists. You’re competing against music, beer and a decimated forest of flyers and posters. My marketing was not good enough. Fortunately Owl didn’t get completely lost and the right people came to see it. Fortunately we were on the Schools Fest. These things aren’t chance, they happened because I worked to make them happen, just as a low audience turn out wasn’t chance either, it was the result of an area where I didn’t work hard enough. Not a mistake I’m going to repeat. This entry was posted in Projects and tagged Briony Horwitz, Cape Town Edge, Grahamstown, Jon Keevy, National Arts Festival, Owl, Theatre Budget. Bookmark the permalink. Mr Keevy, I am inspired by your hard work and transparency. I hope your show moves from strength to strength, as I’m sure it will. It’s good to see someone in the – i hate to use the following term – ‘creative industry’ actually breakdown the ‘fuzzy’ stuff; all the numbers and preparatory tasks like you have. Pump fist indeed! You have the makings of a great producer my friend, keep going. Thanks muchly, I take that seriously coming from you! “Just saw Briony Horwitz in Jon Keevy’s “Owl”. Carefully crafted, beautiful, beautiful script – lyrical and taste-the-words-in-your-mouth poetic; deeply sensitive and moving – could see it over and over again. Excellent direction and amazing performance. A definite highlight of our festival.” Thanks Jon for a fantastic contribution to our festival, the response was amazing and we are honored to have been able to host work of such high quality. No, thank you Neville – as my post says, the Schools Fest saved me. It’s a great example of an organisation putting audiences and artists together to everyone’s benefit. Honest, open and informative – all the same characteristics that make you such a bad poker player!